So what is this all about?! Why by a book for that ridiculous amount of money? The book in question was a copy of one of the most important sources to old Scandinavian, especially Danish, history, a book called Gesta Danorum. Gesta Danorum, or Danorum Regum heroumque Historiae stilo eleganti a Saxone Grammatico natione Sialandico necnon Roskildensis ecclesiae praeposito, abhinc supra trecentos annos conscriptae et nunc primum literaria serie illustratae tersissimeque impressae, as the full impressive title reads, was written in the late 12th century and beginning of the 13th. The author, Saxo Grammaticus, (Saxo the Learned) has been called the father of Danish history writing, and lived ca 1150-1220. We know very little about him and what we do know are what he lets us know himself via his book. His father and his grandfather both served in Valdemar the Great's army, but instead of becoming a military himself, Saxo was given the task by the Archbishop Absalon of Lund (then a Danish town, now a Swedish one) to write the history of Denmark to match the histories of other nations and make Denmark a nation with authority, stardom and depth. Saxo could have been a clerk at the Cathedral of Lund, but we cannot know for sure. Gesta Danorum is as mentioned one of the most important sources to old Danish history. It is a work of 16 books written in Latin. The first 9 books cover the history of legends and sagas, the last 7 books cover kings and events from Harald Bluetooth up til 1185. Angul, of course is the ancestor of the English, whereas Dan is the forefather of the Danes. Saxo’s history of the Danes set the tone for future history writers. He was the one to beat. So that when, for instance, the Swedish history was to be written, Saxo was used as a rule and a source. We do not know what kind of education Saxo Grammaticus was given, we only know that he was educated. He wrote, as mentioned, in Latin. But the Latin he wrote was very atypical for his time. He did not write a medieval Latin, instead he tried to write as Roman as he could, or saw fit. There are no manuscripts left of Gesta Danorum, only a few fragments. But, in 1514 the Danish king, Christian II, and the Archbishop Lave Urne asked a man name Christiern Pedersen who worked in Paris to publish the work as a printed book. It has thence been printed numerous times and translated into several languages, including Danish, German, French, English, Spanish, Italian and Japanese. One of the copies from that first print ended up in the hands of the Swedish historians, Archbishops and brothers Olaus and Johannes Magnus. Both brothers were very inspired by Gesta Danorum as they wrote their own books. Olaus Magnus is most famous for Historia de Gentibus Septentrionalibus and his brother for Historia de omnibus Gothorum Sueonumque regibus. 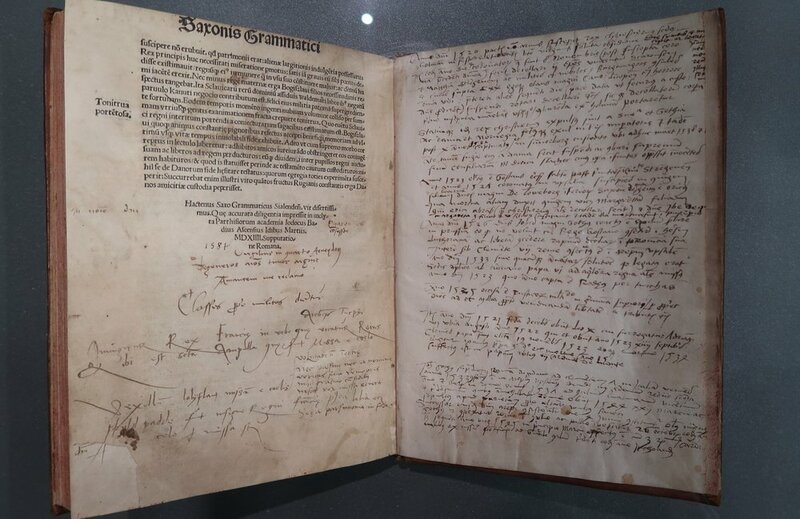 The brothers Magni not only possessed a copy of Gesta Danorum to read, they did what was quite common among scholars of their time – they scribbled in it. They wrote in the margins of the book. They wrote in Latin – which is exciting for us Latinists. They did not always comment just on the text itself: One of the scribbles made by Olaus Magnus concerns the Stockholm bloodbath in November 1520. During this event the Danish king Christian II (the same one wanting to print Gesta Danorum) had a huge part of the Swedish aristocracy beheaded (we call him Christian the Tyrant in Sweden still). This scribble is one of the first accounts of the bloodbath as Olaus Magnus was in Stockholm at the time. Olaus Magnus later on described the bloodbath in his own work. This copy of the first edition of Gesta Danorum, is the book bought by the Swedish Royal Library in March. It was on display for a few short days, and now it can be enjoyed for everyone in its digital form online, thanks to a very swift word by the Royal Library. You can find it here. Daniel and I went to have a look at the book in person, and it was well worth it! To be in the same room as such history is breathtaking. We made a video about the visit and the book for our kind Patrons who support us on patreon.com/latinitium. All in Latin of course.